Hamilton Gutter Pros have built our reputation in the Hamilton, Ohio area by providing the best possible customer service for each client that we serve. We understand the frustration that can come when the guttering system of a home or business is not functioning properly. We specialize in all phases of gutter maintenance from installation to cleaning and repair. Some homeowners prefer to clean their own gutters, but not everyone has the time or physical ability to complete this task. Our team is proficient in reaching the toughest spots to ensure that all debris is removed from your gutters and drain spouts. 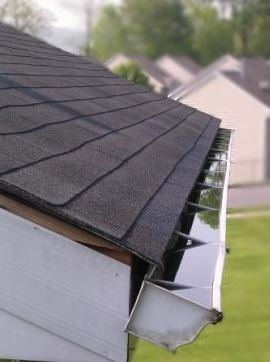 This helps to prevent damage to the surrounding landscape that can happen when gutters overflow. It also helps to extend the life of the guttering system by cutting down on the amount of mold, mildew and other corrosive events which can weaken gutters. Our professional staff have the knowledge and experience necessary to expertly install new or replacement gutter systems for your home or business. We're happy to provide you with gutter installation cost estimates upfront if you are interested in receiving a quote. For those who prefer do it yourself, call us for assistance and gutter installation instructions. We can also help you with cost per linear foot if you are interested in finding out how much it will cost to install your own gutter system. We also specialize in vinyl gutter installation. We've found these materials to be strong and durable alternatives that eliminate any issues with rust due to excessive moisture. Hamilton Gutter Pros are fully trained in all areas of home and business gutter cleaning, maintenance and repair. If you're having issues with your current gutter system, we're available to discuss your situation and give you an honest assessment of the problem. Whether you prefer to make your own repairs or to get help, we are here to serve the residents of Hamilton, Ohio with a full range of quality services and products. It can be difficult for the average homeowner to identify the extent of guttering issues or any damage that may lie underneath the system. In many cases, damage that has already occurred is extensive and needs attention quickly. In some instances, what may appear to be a major problem can possibly be remedied with a few minor repairs. This is what we do and we take pride in offering quality services and products to our clients. We take the guesswork out of gutter repair for you. We fully understand the damage that a clogged drainspout or gutter can cause. When there's a problem, we work with the client to find the best time to show up for an inspection. We work quickly but thoroughly so you'll know the nature of the problem, the best solutions, and all of your available options. We'll give you an estimate of the cost for services so you can decide how you want to go about implementing the solutions. Hamilton Gutter Pros provide full service gutter expertise for our customers.